The family resemblance between the Samsung Galaxy Tab 2 10.1 and the Galaxy Tab 2 7.0 is strong. The styling is very minimalist, with rounded corners and smoothly beveled back. 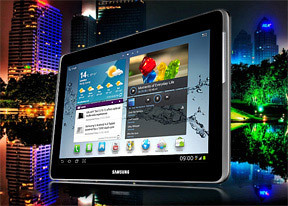 The Samsung Galaxy Tab 2 10.1 is built around a 10.1" PLS LCD screen with a resolution of 1280 x 800 pixels. While the resolution is far from stellar, it's the most common choice for 10-inch tablets. The screen is pretty impressive - viewing angles are very good (although there's a noticeable blue tint when viewed at an angle) and the blacks look reasonably deep (we'll measure them when we get a review unit). Pixel density is nothing exciting (149ppi), but big tablets like the Tab 2 10.1 are viewed at a bigger distance than phones, so it's not much of an issue really. The Samsung Galaxy Tab 2 10.1 has no hardware controls at the front - it doesn't need any with Ice Cream Sandwich inside. All you get here is the front camera and some sensors. There's no earpiece (like on the 7" Galaxy tablets), so you can put the tablet up to your ear and use it as a phone, but loudspeaker mode or a headset (wired or wireless) would make a lot more sense anyway. The two speakers are on either side of that port. You have to be careful not to place your palms over the speakers when you hold the tablet landscape. At the top we find the 3.5mm audio jack along with the SIM compartment and microSD slot, both sealed with plastic lids. There's also the Power/Lock button next to the volume rocker. The microphone is at the bottom and you are warned upon launch of the camcorder app against covering the microphone. The Samsung Galaxy Tab 2 10.1 uses a proprietary 30-pin connector for charging and connectivity, which is located at the bottom of the tablet. Single, multi-function ports like the 30-pin connector on the Tab 2 10.1 mean you'll need a proprietary cable for both computer connections and charging. It's not a happy moment when you need to fill up the battery, but all you have is a microUSB charger. The lack of USB charging is a common fault of tablets, but that doesn't mean we have to like it. The journey ends at the back of the Samsung Galaxy Tab 2 10.1 Anyway, the 3.15 megapixel camera goes it alone, there's no LED flash like in the Tab 7.0 Plus. The Samsung Galaxy Tab 2 10.1 is powered by a 7000 mAh Li-Ion battery. There are no official quotes on battery life yet, but we'll be doing our own tests when we get our hands on a retail-ready unit. The back cover is made of soft plastic, which is nice to the touch and offers decent grip. It's matte too, so it hides fingerprints very well. As you would imagine, you can't pop this cover open to access the battery, which is par for the course. The Samsung Galaxy Tab 2 10.1 can easily be held in one hand and will slip into a coat pocket or a purse. The curved back doesn't hide the 10.5mm thickness too well, but makes it easier on your hands when holding the tablet. The build quality of the Tab 2 10.1 is great, there were no creaks or weak spots.